As interest rates have been rising, I’ve become interested in bank stocks. Unfortunately, I’m not as well versed in the fundamentals associated with banks. However, I’ve been working to correct this deficiency in my core competence by researching and writing a series of articles on what fundamentals work with bank stocks. I’m going to start by exploring return on equity (ROE). Banks often use ROE as a performance target. Return on equity is a key profitability ratio that measures the amount of income that is returned to shareholder equity. Given that ROE is a profitability measure, I expect that stocks with higher ROE would produce greater 1-year returns. Let’s run a backtest to find out. Starting with my standard method of backtesting stock fundamentals on Portfolio123 that I described in an earlier article, I then just selected stocks in the banking subsector and changed the benchmark to the Financial Select Sector SPDR Fund (XLF). 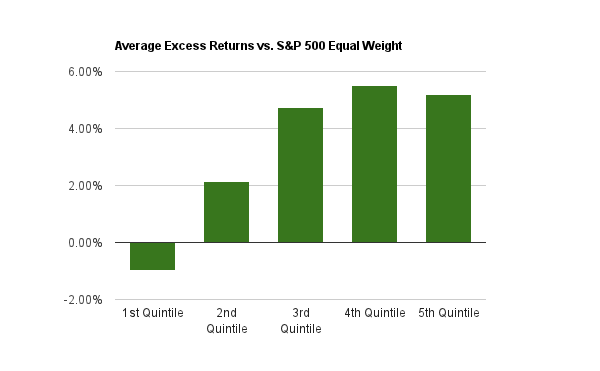 The average excess returns for each quintile are displayed in the chart below. They are not what you would expect. 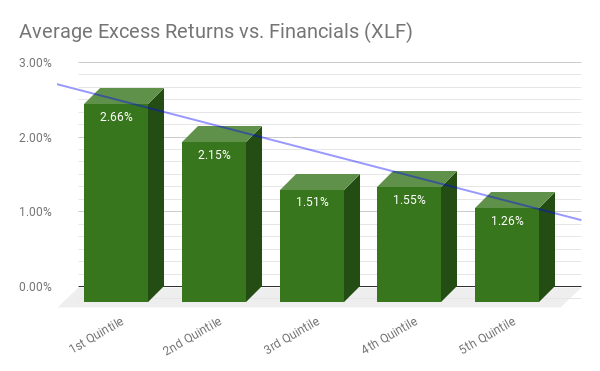 Surprisingly, banks ranked in the lowest 20% (first quintile) had the highest average excess returns as compared the XLF benchmark over a one year holding period with annual rebalancing from 2000 to the end of 2017. 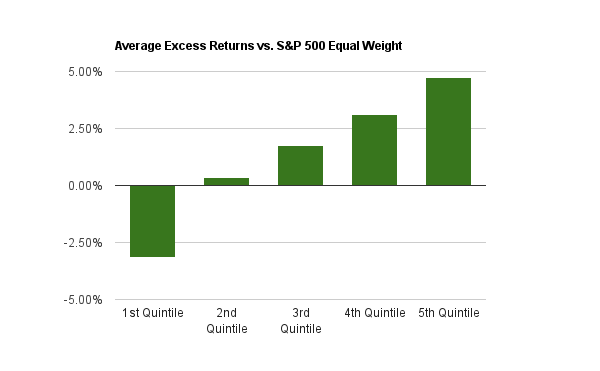 Banks with the highest ROE in the 5th quintile had the lowest average excess returns. As you can see in the bar chart above, the trend is almost linear, but returns seem to decrease with increasing ROE. The full details of the backtest are in the table below. The value of $10,000 invested on January 2, 2000 in the banking sector would be $37,900 at the end of 2017 for the lowest 20% of bank stocks ranked by ROE. Over that same time period, the value of $10,000 invested in the top 20% of banks stocks ranked by ROE would have been only $34,280. This is a very unanticipated result. My hypothesis is that we really need to conduct a DuPont analysis that separates out return on assets (ROA) and leverage from the return on equity to better understand these results. The financial crisis of 2008 might have really hit highly leveraged banks that had great returns on equity. I’ll post Part 2 of this series on bank stock fundamentals shortly where I will examine return on assets for the banking sub-sector.